I did a load more scanning this morning and have added downloads for most of the cluebooks that I’ve already looked at in the blog, namely Wing Commander Armada Playtester’s Guide, Wing Commander 1 & 2 – The Ultimate Strategy Guide, Shadowcaster Illuminations and Official Guide to Wing Commander 3. I’ve also been donated a couple more by Mirir which are the Official Guide to Crusader – No Remorse and Privateer Playtesters Guide. That’s the lot for now, as I’m heading off for a few days. I’ll see what I can do with Forge Of Virtue when I get back, although the novels are going to be harder to do with the print so ridiculously close to the spine. The first book 2 books, I’ve looked at in the last 2 days didn’t take much reading. This is an entirely different kettle of fish with the book reading as a novel almost from start to finish. 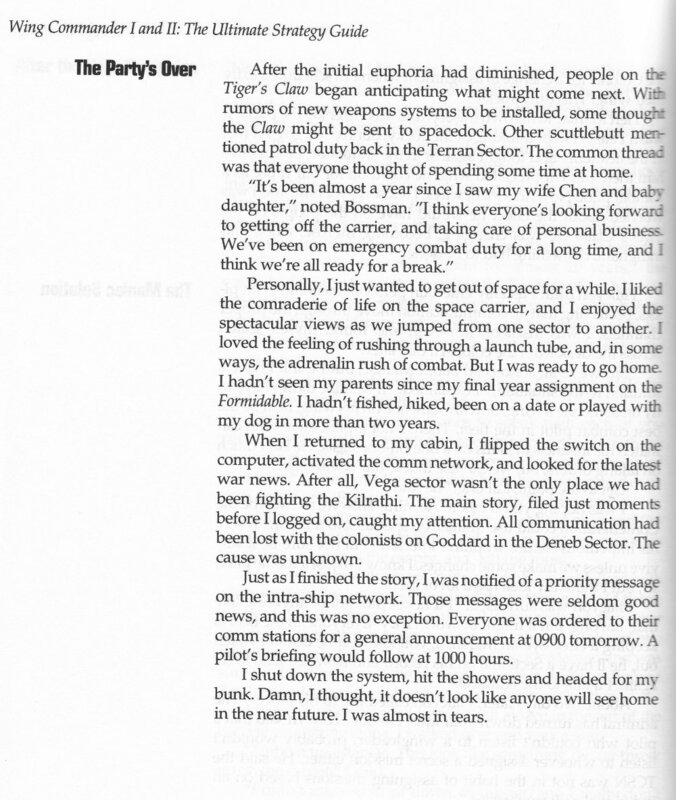 It’s spread out over 300 pages with the first 220 pages covering Wing Commander 1, Secret Missions 1 & 2 + Wing Commander 2 and the remainder of the book being dedicated to interviews and the story of how the game was devloped. It was published in 1992 by Prima and written by Mike Harrison. 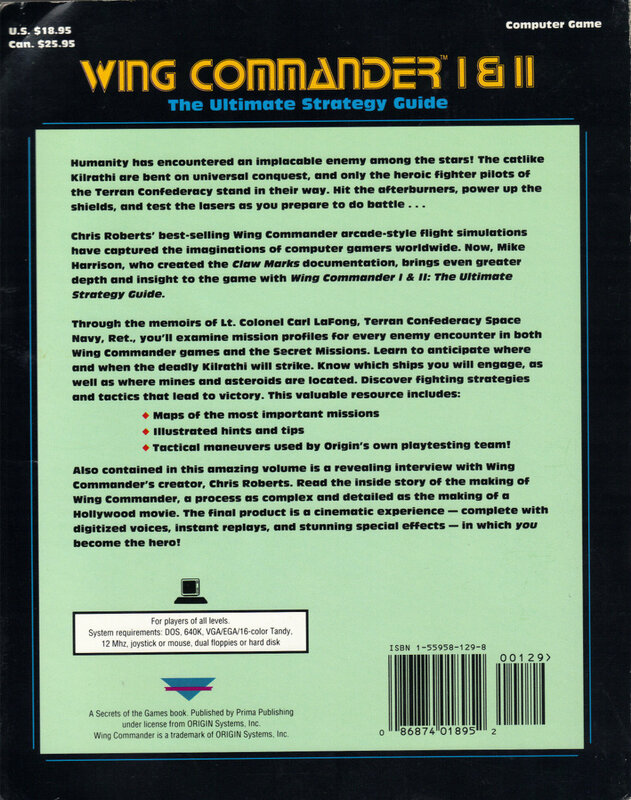 The name may not be immediately familiar but he is described on the back cover as the person who wrote the Claw Marks manual in Wing Commander making him an excellent choice for this. In the book itself two other people are credited with that manual so I guess he must have contributed and/or managed rather being the primary author. The book is written from the viewpoint of Lt. Colonel Carl T. LaFong, a 73 year old retired Conferderation pilot who flew all these missions in real life before a guy called Tristan Roberts decided to base his next bionetic holo-vid on his experiences. It starts off with 50 pages or so with Lafong’s life in the Academy before joining the Tiger’s Claw. It reads quite well as a novel but also introduces basic tactics that you may want to use in the game. Lafong is in the same class as Maniac and to a large extent, the storyline throughout the book concentrates on his relationship with Maniac. Maniac starts out brash and unorthadox before gradually maturing and attempting to conform before breaking down altogether. It’s curious that Maniac is seen as such an important character as he played a very minor role in all these games, before becoming the irreverent sidekick in WC4. After the academy it gets to the missions proper. 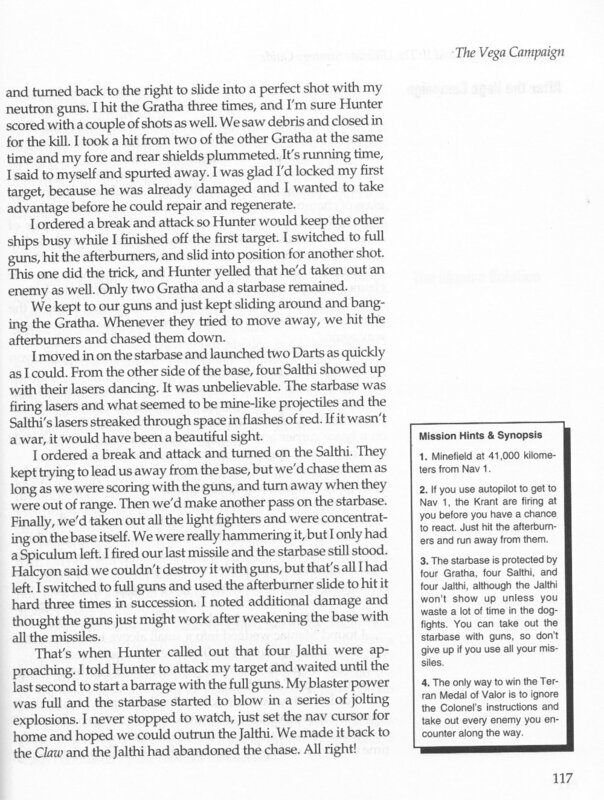 Each mission has 1 or 2 pages describing what occured, still written as a novel with a map of the mission and a little side box containing notes. It’s at this point that the book flounders if you are attempting to read it as a novel. If you can imagine trying to describe each mission in detail, over and over you will soon run out of ideas and it inevitably becomes extremely repetitive. However, if you are just reading it as a one off to get help on a particular mission, it works reasonably well, although I’m not sure that there is much more benefit from reading the text in most cases. It does give some tactical advice at times but Wing Commander isn’t the most tactical of games. 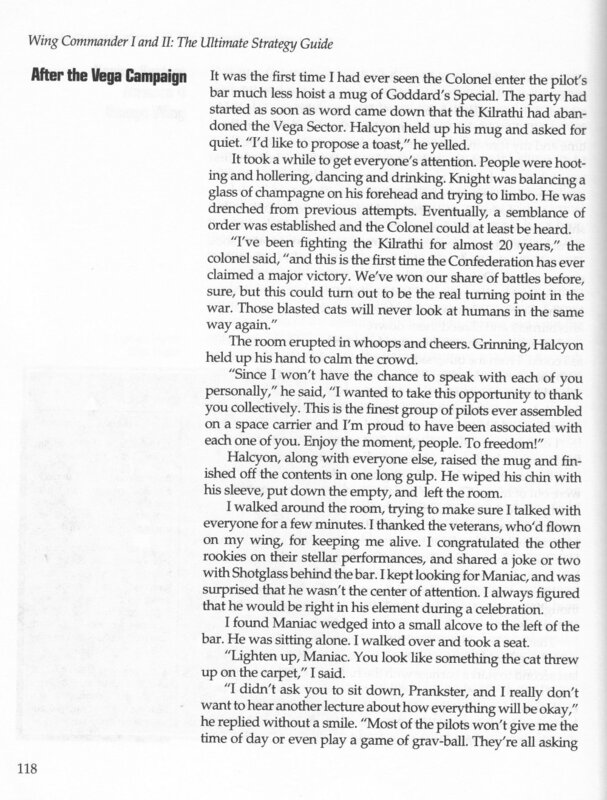 After the end of Wing Commander I, the author admits as much in a side panel and for the remainder of the book, the mission descriptions are briefer and always on a single page, with less story. After each series of missions in a system, there are a couple more pages of storyline, which are far more entertaining than the missions themselves. I found myself skimming the mission reports and concentrating on these. 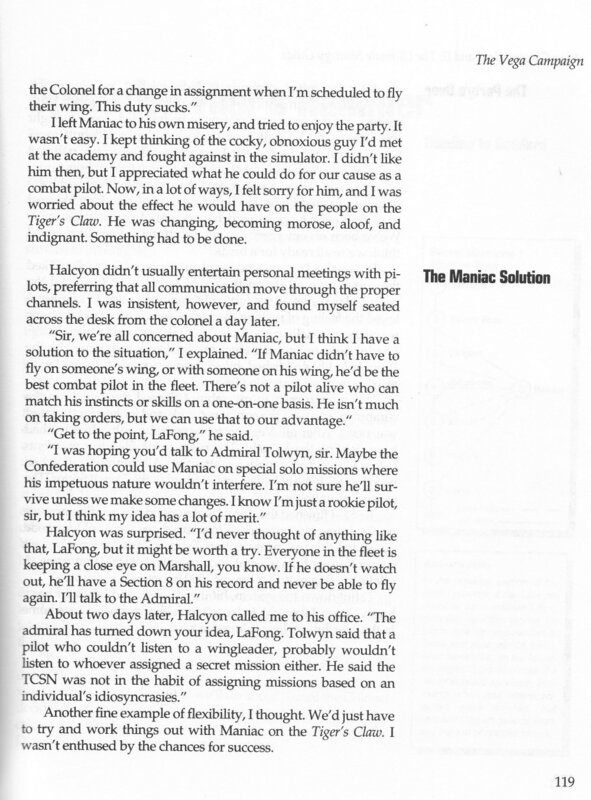 Wing Commander I did of course feature a branching storyline. The guide gets around this by saying that these missions did occur but were either flown by pilots on other ships or other pilots on the Tiger’s Claw and presents their reports for the missions. These storyline segments also drop off in frequency after WC1 and it makes the rest of the games feel rushed by comparison, although there is still plenty there if you just want a mission guide. 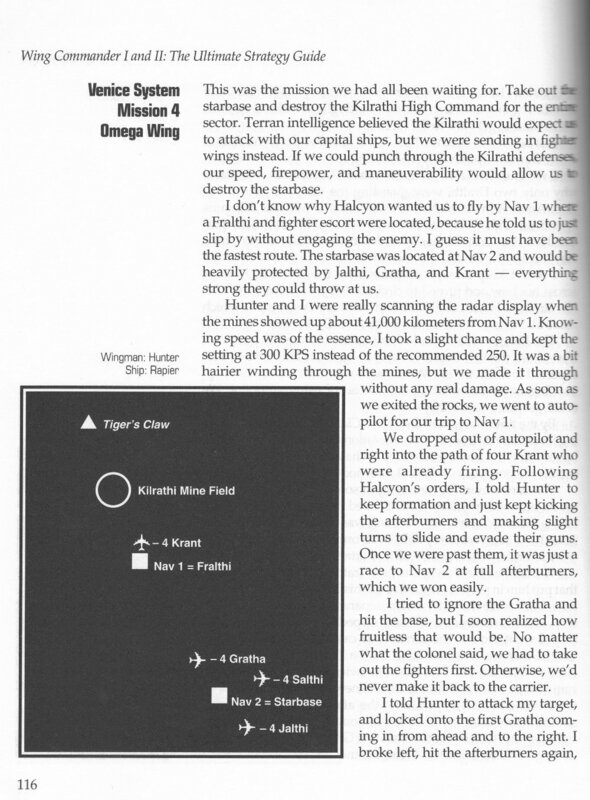 For Wing Commander 2’s non-winning path missions, however all you get is a few pages with maps of what enemies to expect with no text whatsoever. This lengthy section tells you everything you could want to know about how Wing Commander came about, and gives some insight into working for Origin in the early 90’s. When I read this the first time I was particularly intrigued by the lip-synching in Wing Commander. I wonder how many people even noticed this. It does show the effort for extra detail that goes into a game although if this sort of thing gets through, I can see why a producer would have to step in at some point and just decide to stop adding things and publish the game. It’s also interesting that for a large part of the development of such a cutting-edge product it was a very small team actually working on it. All in all, this is a decent read for a strategy guide. 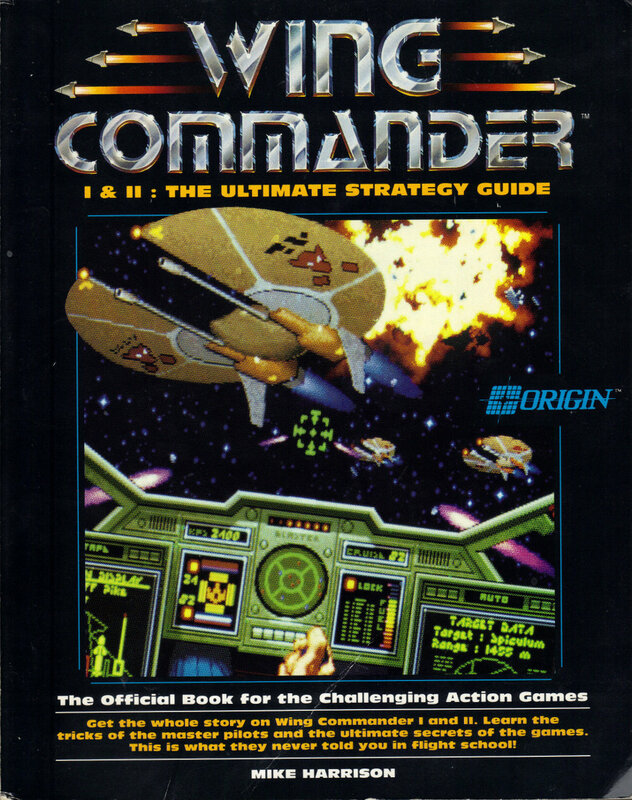 I can’t imagine many people would actually need a guide to get through Wing Commander so it’s just as well it has more to offer than a straight walkthrough. The interview sections at the end would be reason enough to buy this at todays prices. Since I’m putting it up for free, it’s certainly worth reading through the scans above if you have any interest in Wing Commander. I’m quite enjoying reading through these books but my hardware has arrived quicker than expected so it should be back to Longbow 2 next, provided I can get everything working correctly.